You have two types of discounts that can be added to an invoice. Line item discounts or total invoice discounts. The graphic below explains the two types available. 1. 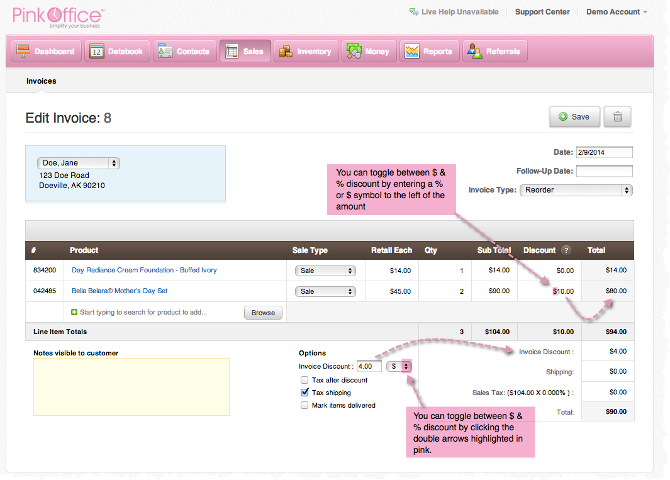 The line item invoice is applied by either tabbing between the line item fields or clicking directly in the "Discount" box. Then typing the discount amount in the discount field. You can toggle between a whole dollar ($) discount and a (%) discount by simply entering the symbol first. 2. Total invoices discounts are applied by entering the discount amount in the "Options" area of the invoice. You can also toggle between whole dollar ($) and (%) discounts by clicking the drop down arrow to the right of the amount field.